At the same time that I fell in love with the first scarf, I identified another one that caught my eye, less for the overall design and more for the colour combination and the Venetian masks. 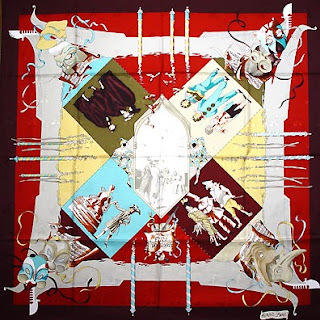 Originally released under the "Carnaval de Venice" ("Venice Carnival"), "Fetes Venitiennes" ("Venetian Feasts") is a reissue on a distinct fabric - the jacquard silk, renowned for the technique of weaving a pattern within the fabric that renders the material distinctly unique and considerably more valuable. The design features participants to the Venetian carnival, dressed in period costumes. Of particular interest are the background colours of the expanded center around the middle: each group of characters is depicted against a background colour that is repeated in the next group, immediately to the left, underneath the characters (forming a triangle against which the masks are placed). 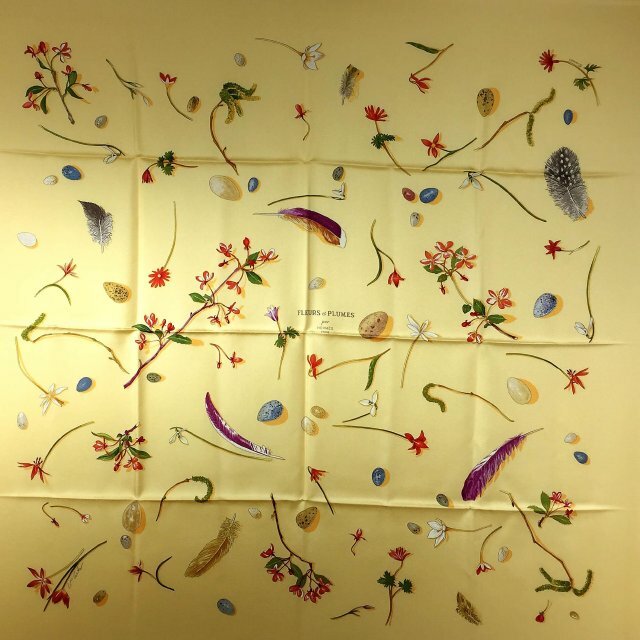 The scarf is absolutely stunning, a splendid display of artistic acumen, attention to detail and harmonious combination of colours and shapes. The autumnal colours are yet another aspect that renders this scarf superb. 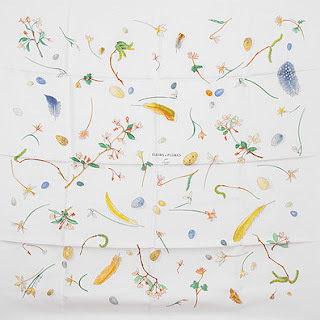 I noticed this scarf in 2005, yet only more recently did I become aware of the designer - Hubert de Watrigant - a talented and accomplished artist in his own right, whose paintings continue to inspire audiences the world over. His specialization is in horses, bulls and hounds, and many museums (including the "Living Horse Museum" in Chantilly, France) feature his creations. It is him behind the "Plaza de toros" design, as well as the "Ballet equestre" and "Feria de Seville" (more on these later). I recall vividly how mesmerized I was when I became aware of the Hermès scarves. I was well familiar with the brand, for I have been enjoying the Hermès colognes for a long time (the one distinct element of the Hermès world is the soothing fragrance that fills every boutique, a distinct aroma of discreet scents, emblematic of the "Maison" ("House" as the name a French company with a long-standing tradition likes to refer to itself); my favourites remain "Terre d'Hermès" ("land of Hermes"), which elicits compliments by all who get close enough to "savour" the scent, as well as Poivre Samarcande and Osmanthe Yunnan, two distinct scents from the Hermessence, a private collection of fragrance creations by Jean-Claude Elena), but the sight of all those colourful scarves was something else. The richness and natural shine of the silk, the palette of colours, the impeccable display and the subtle, heavenly scent in the boutique were all a world apart unlike any other I had experienced before. Then there was the unfolding of individual scarves. It was the first time that I had realized that each one holds a message, to be revealed only to those who take the time to study it, to descipher its secret and interpret its meaning, and this was an experience that I, as an explorer of boundless curiosity, was all too eager to embark on. Equally vivid is the memory of the feelings this design has triggered in me. Although not exclusive, my taste appears to be for "organic" designs, such as flowers and plants. 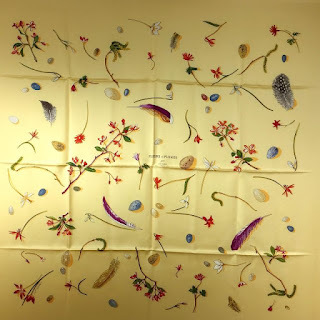 So it is no surprise that during my first visit at an Hermes boutique, I fell in love with a model called "Fleurs et plumes" ("Flowers and Feathers"), issued in 2006. The background - a soft light orange, so warm and so intense - is so impactful, as are the shades making up the design, that it won me over on the spot. 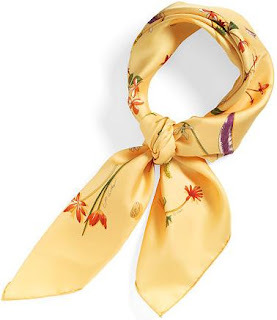 The harmonious combination of various flowers and feathers delicately spread over the scarf in no apparent order is both uplifting and very calming, and it caught my attention and spurred my curiosity and to this day, I take the time to "study" every element of this design without getting bored or otherwise losing my admiration for it. Thus has begun my love affair with the Hermès scarves. Of course, as the time went by, my knowledge and experience have expanded substantially, as I will reveal in the next posts. Incidently, the designer for this scarf is Leigh P. Cooke, who to date remains one of my favourite designers in the service of Hermès.